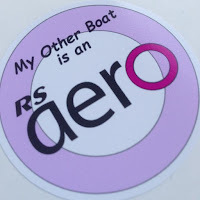 When I returned home from sailing on Monday my wife asked me if I had seen any other boats out sailing. Hmmm. No, I didn't. There are still plenty of boats on their moorings around here, but not many people out sailing during the week. Especially in the middle part of the Sakonnet River near Fogland Beach which was where I was out that day. There's something very relaxing about sailing on a stretch of water a dozen miles long and not seeing another sail. Something a bit worrying too; nobody around to help me if I get into trouble. But there was not much chance of that on Monday. It was a sunny, light wind day. A day to practice roll tacks and roll gybes. It's strange that almost every time I spend a session mainly focused on tacks and gybes I discover how to change my technique slightly to improve the effectiveness of these moves. And Monday was no exception. October has been a good month on my journey to 100 days of Laser sailing in 2008. This was the twelfth sail of the month, already the most sails in any single month. At the beginning of the year I would not have predicted that October would be the month when I sailed the most. But it has been a great month of relatively mild weather and fair winds. Who knows what November will bring? Will it snow? Will Tillerman wimp out and abandon his quest as the water gets colder? Will Tillerman acquire the support of any more outlandish sponsors? 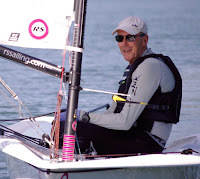 Will Tillerman find something new and interesting to say about each of the remaining 19 sailing days or will he write posts full of lots of questions? Will Tillerman stop referring to himself in the third person? Is this of any interest, or should I blog about the shocking story making the political news in America today, all about how a certain professor went to a colleague's leaving party five years ago? Terrifying! What would Joe Sam the Plumber Country Music Artist say? Where is Joe the Plumber?